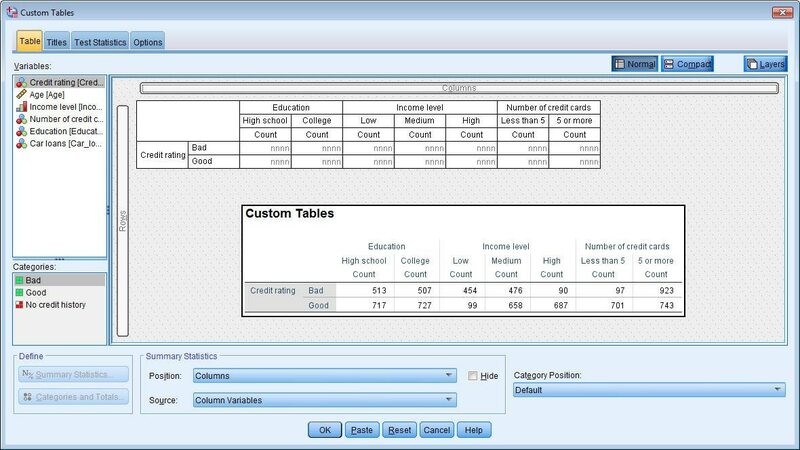 A drag-and-drop table builder interface allows you to easily select variables and options instead of using multiple menu choices and dialog boxes for different table types. Provides more than 160 summary statistics including confidence intervals and standard errors. Lets you calculate statistics for each cell, subgroup or table and percentages for nested variables. Lets you nest variables to any level, and cross-tabulate multiple independent variables in the same table. Displays frequencies for multiple variables side by side with tables of frequencies. Enables you to display multiple statistics in rows, columns or layers, and show significance test results directly in custom tables output instead of in a separate table. IBM SPSS Custom Tables requires a valid IBM SPSS Statistics Base license.